Morah Katie: Tell me what you know about apples. Evelyn: You can make apple juice with them. Clara: They can come in all different colors. Judah: They grow on trees. Ari: You can use them to make a pie. Olivia: They have stars in them. Morah Katie: Let's look at those stars. 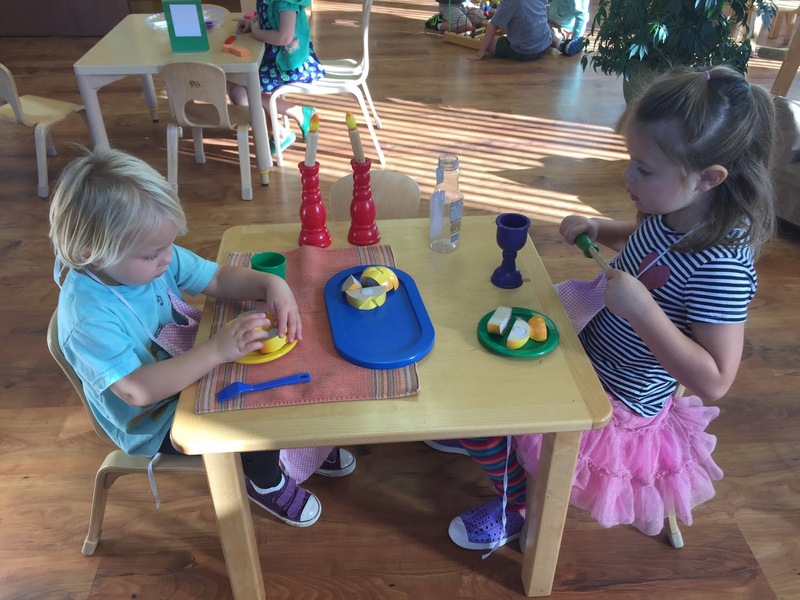 Morah Katie: What would happen if we left these apples out without eating them? Abe: They would become yucky and rot. 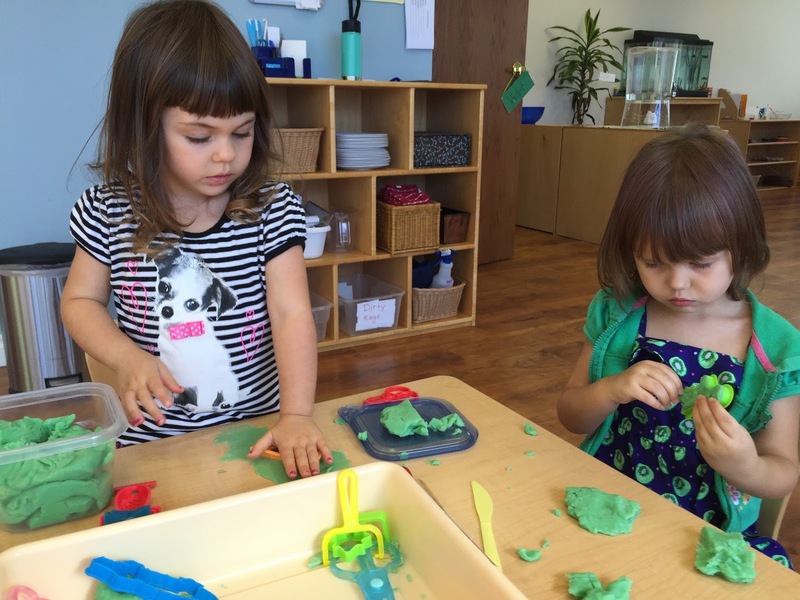 Morah Katie: Let's conduct an experiment. Please take a deep breath in. What did we just fill our lungs with? Morah Katie: What does oxygen help us do? Morah Katie: Does it help apples grow? Clara: Yes, it helps the trees grow. Morah Katie: I don't see the oxygen we are breathing, where is it? Morah Katie: Even around the apple? 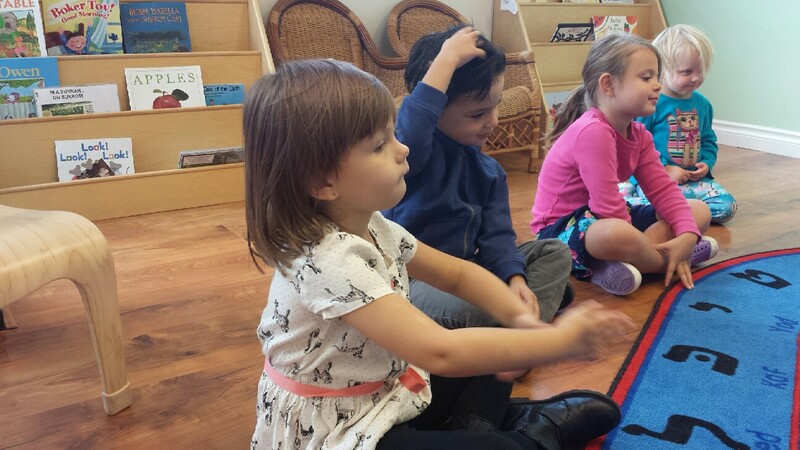 Morah Katie: Before we continue with our experiment we need to learn 2 new words. The first is enzyme. All living things have enzymes. They are "specialists" or experts at doing their job. The second word we need to learn is oxidation, which occurs when an element like an enzyme combines or mixes with oxygen. 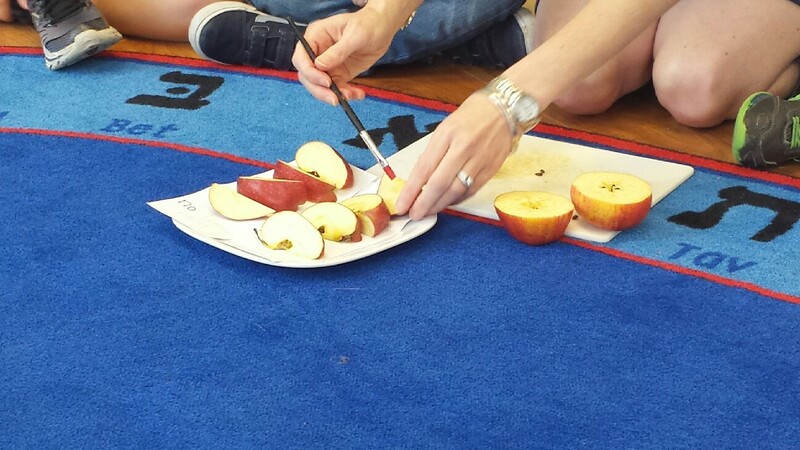 Morah Katie: What do you think will happen if we leave the apples exposed during school? Ari: They will turn yucky brown. Morah Katie: They will turn brown because of oxidation. The oxygen in the air mixes with the enzymes in the apple and causes the apple to turn brown. 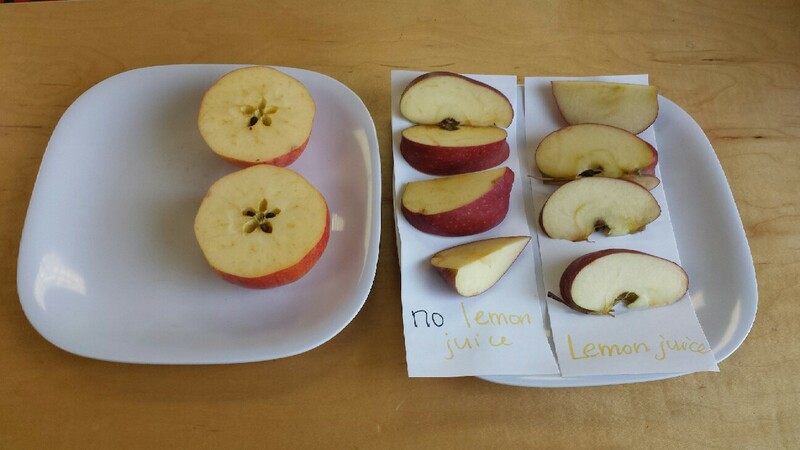 Let's see what happens when we put lemon juice on some of the apple slices, and nothing on the others. At 9:30 we placed our plate on the shelf. All the apples were looking tasty. Before story time we checked in with our apples. Clara: The ones without lemon juice are looking brown. Abe: This one looks really brown. 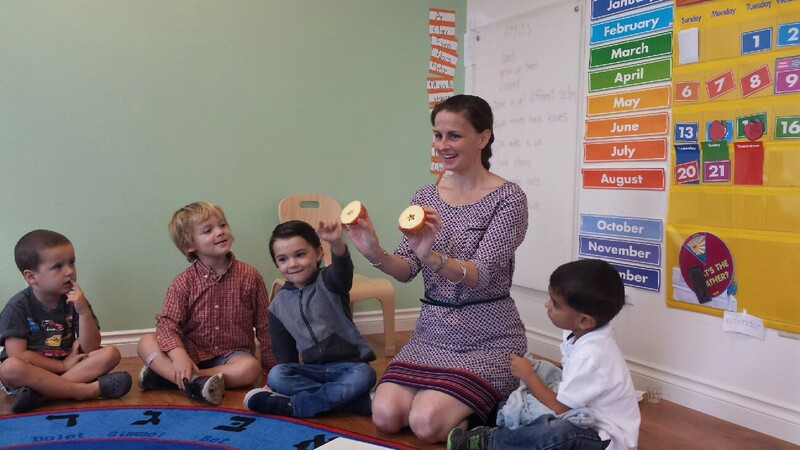 Evan checked in with our apples during class time. Evan: They are really brown, they don't look very good. 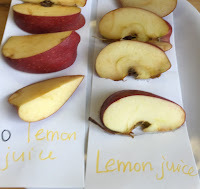 But the lemon one looks ok.
Morah Katie: Who can tell me what happened in our experiment? because the lemon juice was protecting the apple. Morah Katie: What is the process called that causes the apple to brown? 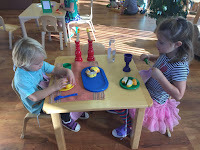 While our apples were, or were not oxidizing, many wonderful conversations occurred. Evan: Ari I had the sprayer. Evan: Morah Katie I had the sprayer first Ari won't give it too me. Morah Katie: Boys I did not see who had it first, how can you solve this problem. Ari: Evan can use the rag to clean the paint and I will spray with water. Evan: Oh yeah we can do that. Abe: Morah Katie I crashed in to Judah and I don't know what to do. Morah Katie: Have you asked him what you can do to help him feel better? Abe: I am sorry I crashed int you Judah, what can I do to help you feel better? Judah: You can just say sorry. Abe: Ari when you tell me I can't play I get sad, can I play with you? Ari: Well I wanted to play alone but yeah you can play with me. Nora: Clara you kicked me. Clara: Oh Nora, I'm sorry how can I fix it? Nora: You can kiss it better. Clara: Ari you were spinning and fell into me. Ari: I'm sorry. What do you need to be better? Clara: Can you control your body next time? Ari: Ok I will try. These conversations are similar to conversations I've previously shared on the blog this year. or were solved completely by the children themselves. We have been keeping track of how many days we have come to school. We have only had 13 days of school this year. These moments of kind words and positive solutions point to a very happy and productive year. Feeling sweet is better than feeling sour.